Bryan Sherman wrote this memoir for family and friends in 1974 at age 82. Installments 1 & 2 concerning his childhood on the farm and education can be found on the Home page. Installments will be posted each Sunday. There will likely be 8 installments in all. The words are exactly as written, excepting a very few instances where editing was necessary for clarity. When World War I came along I was drafted into the service. I had been farming on shares with Dad and my brother Elmer since I left school. Upon registration, I was placed in 4F (physically unable to serve) for some time, when all of a sudden I was placed at the top of the list, and on June 28, 1918, I was called to the service. I was 26 years old at the time and had gotten used to being away from home, so I didn’t mind it so much except for the thought of going overseas to a foreign country. I was ordered to report to the county seat, Elkader, to ship out. The morning I left Elkader, I was put in charge of the contingent from Clayton County. We went by train from Elkader to Beulah, in northern Clayton County, where our car was put on the main line of the railroad headed west. We reached Mason City about noon where our lunch was brought to us in the railcar in containers the size of shoe boxes. When we were done eating, we were told to throw the boxes out the window to be picked up later. We continued on and reached Des Moines where I turned my contingent over to an officer who transferred us across to the Inter-Urban electric train taking us out to Camp Dodge. There we were placed in barracks for the night. 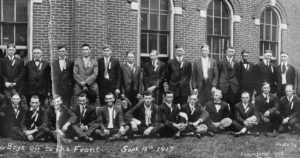 Sept 1917–Clayton County boys in front of the courthouse in Elkader, ready to ship out for military service during WW I.
I was assigned to Company L 352nd Infantry where I was to get my early army training. The next morning after breakfast we were taken to the induction center where we were finger-printed and given tests both oral and written to find out our scholastic qualifications. We were then issued our uniforms. We were now in the Army and our training began. After a month or six weeks of training some of us were transferred to the organization known as the Depot Brigade. This was where they trained non-commissioned officers, but in a short period of time the call came for a Military Police outfit so they took us and made two companies of us (A and B) Military Police. I was in Company A. We were then moved to the North end of Camp Dodge where we were trained and conditioned for overseas service. One thing I remember was to have to help clean out the horse barns that had been left by some other outfit and we never did see a horse. I did get to come home before going overseas. I left Camp Dodge for Edgewood Saturday evening and came back Sunday night. Going back two or three weeks– my folks had come down to see me at Camp Dodge and I got to spend the night with them in Des Moines. This was during the 1st three weeks I was there. 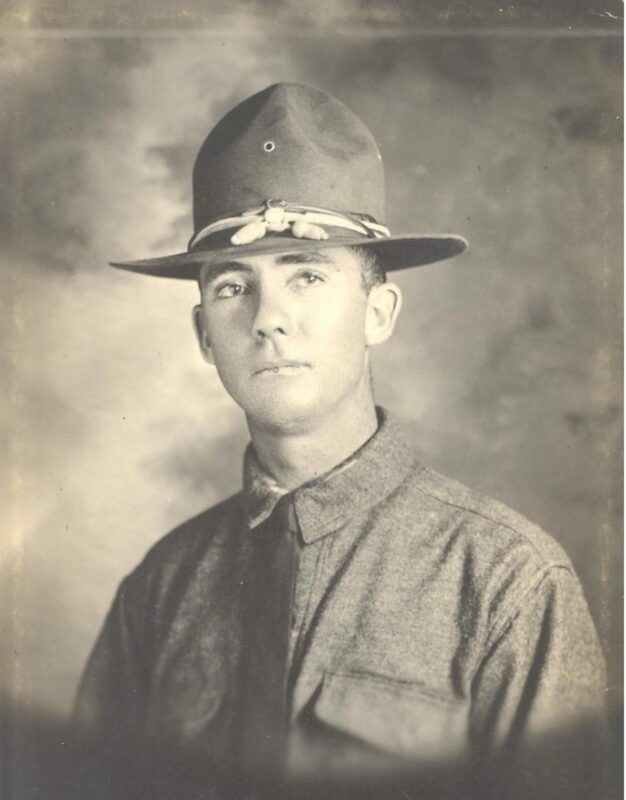 We left Camp Dodge by train August 10, 1918, and in the early morning as we went through Chicago, Illinois, I was on Guard Duty at one car door and I gave a letter to a person on the platform to mail for me. We stopped off in Cleveland, Ohio, and we all went down and took a bath in Lake Erie and put on clean clothes before continuing on. Before reaching New York our train was stopped at a town (I forget the name) where we were all allowed to wander around by ourselves, but had to be back on the train by midnight. The next morning we detrained at Weehawken, New Jersey, and got on a ferry which took us to our train which was to take us to Camp Mills, New York, August 13, 1918. I remember passing the Statue of Liberty. I didn’t know it at the time but was told later that we went under the Hudson River before we got off the train at Weehawken. Before I go any farther I must go back to the first 3 weeks at Camp Dodge where we received our shots and inoculations. One every week for 3 weeks for small pox and typhoid. My small pox didn’t work as I had been vaccinated when a child and was immune. What brought up this paragraph was the fact that the Company had lost or mislaid my papers of inoculation and so I had to have the typhoid shots all over again before I could go over seas. Well that having been taken care of, I was ready for my first night in Camp Mills. That first night I went on detail in a truck into New York City after provisions and I had a little trouble finding my tent on returning to Camp. We were supposed to get on our ship in New York Harbor but for some reason it couldn’t get in there so we had to entrain August 15 and go north to Halifax, Nova Scotia, arriving August 16. That was a very interesting trip and the scenery was very pretty at that time of year. At Summit, Vermont, the ladies of the town came on the train with baskets of sandwiches and filled our cups with coffee, so we didn’t have Army fare that night for supper. Sometime the next morning we reached Halifax, Nova Scotia, Canada, and were immediately taken to our ship. It was an old English ship called Desmontheuis and we stayed at anchor out in the harbor for a few days before our convoy picked us up and we went out to sea. While in the harbor I got my first boat ride. About 30 of us went over the side down rope ladders to one of the lifeboats and by using oars we 30 men powered the boat, with an officer to guide the boat and tell us what to do. After rowing around the harbor awhile we were taken aboard ship again. We left Halifax August 19 and with our convoy started for England. Our work onboard ship was just routine. We were taken down in the hold and issued fatigue clothes and each given a life preserver to carry with us at all times. The first day or so wasn’t too nice until we got over being seasick. We had our regular guard duty day and night and an exercise period every morning. Our food on the English ship wasn’t what we were used to, but after our mess sergeant bawled out the cook we got better food. We had plenty of fresh water for our canteens (for drinking) but had to use sea water for bathing. We were given a bar of salt water soap which did rather well. At the canteen on board we could buy a soft drink (ginger ale) which was quite good compared to the taste of the water. For sleeping we didn’t have bunks, but hammocks made of canvas. These we didn’t use much as most of us would rather lie on top of a table which seemed to be under each hammock, or on the floor. Of course this was all down below the water level. It took us several days to cross the ocean to England. Our convoy consisted of 3 or 4 other ships two of which were destroyers and were the watchdogs of the convoy, protecting us from German submarines. These ships all flew the American flag. We finally landed at Liverpool, England August 31 and as we got off the ship we were handed a card to be mailed back home to our family. It was a card from King George of England welcoming us and letting our folks know we had a safe voyage. One of the things I remember about Liverpool was the cobblestone pavement and how rough it was to march on as we went out to Knotty Ash Camp. This camp had another name which shouldn’t be printed in this story. We were billeted there for a couple of days when we were loaded on a train for the trip across England on September 2nd. First we had been lined up for a supply of sandwiches to take with us. On the train we were placed eight to a compartment and rushed across to South Hampton which we reached the same day. Riding in an English train was almost like going through a tunnel as the tracks were below the level of the land on either side and one couldn’t see much out the windows. On our arrival in South Hampton we were supposed to cross the English Channel that night but it was found to be too dangerous so we were put in tents for the night. On the night of September 4, 1918 we loaded on an old Italian cattle boat and after a very rough night crossing the channel we landed a Le Havre, France, and were we glad when we got off that boat and off the English Channel. At Le Havre (September 5) we were loaded into French boxcars with straw on the floor. The cars were marked 40 Hommes or 8 Chevaux meaning 40 men or 8 horses. In the French boxcars there was standing room only. On September 7 we reached the town of Semur where we were billeted for one week in an old barn. This gave us a chance to clean up and wash our clothes. Then on September 14 we left Semur and on September 15 we arrived in Hericourt where we were to stay for a while. Before getting to Hericourt we had a little train trouble. As we were on an upgrade into the town, a coupling came loose and let the rear of the train start rolling backwards. As it happened we had some old railroad men in our outfit who knew just what to do and before the cars got too much momentum they climbed the ladders to the top of the cars and set the brake. I was glad they did, as I was on this section of the train! As it happened no one was hurt and many didn’t realize the danger. We stayed in Hericourt for about three weeks where we got used to the ways of the French people. We were housed here in the upstairs of an old house and barn built as one unit. That was the way of many of the old French houses. They could go out the house door into the barn part. I remember we had to use brooms made of brush to sweep the area around the barn. I think it was at this place that we went out where some timber was being cut and got pine boughs to sleep on. We had only just got accustomed to our quarters when we moved again. On October 6 we left Hericourt and arrived in Fontaine October 7. This place was quite a large railhead and we stayed there for about one month, sleeping in a barn again. At this time we were getting closer to the front lines and could hear the guns at times. We left Fontaine November 10 still traveling closer to the front line and the next day, November 11, we got word that an Armistice had been signed and that the war would be over. Some of our infantry (8th Division) were already in the trenches. On this move we were on foot and had traveled about 40 kilometers and we were getting tired and were glad when we stopped at Ville St. Etienne November 12 where we stayed about 2 weeks. We left there November 26th and arrived at Dermauge on November 30th. There we spent about 1 month. The first part of January 1919 we were loaded on a train (this time U.S. box cars) and arrived in the town of Goudrecourt on January 5,1919. This was a fair sized town and was to be our home for some time. Installment 4 next Sunday: Saying goodbye to France, and coming home.